Even the sky and the water may be dominated by our models, we have in fact a line of drones by both aerial acrobatics fromYuneec,Walkera,Dji, Dromida, a mini drone multiblade that will make you fantastic videos or crazy acrobatic flying. Some categories are constantly updated so you always jump to know the latest news. - The procedure for payment once you have chosen Paypal as a payment method, and when you get to the PayPal web site , just click " Do not I have a Paypal account " at the bottom of the page, the procedure will continue using the standard method for payment by credit card . - Credit Card ( Visa , Visa Electron, Mastercard, Maestro , etc.). - Paypal. Can access the site www.paypal.com for more information and specific payments via PayPal. The goods ordered by the Customer shall be kept busy until receipt of proof of transfer , the email with the confirmation of the bank transfer must be sent away (by fax or e-mail ) no later than 3 working days from the date of acceptance of the order. The sending of the ordered goods will only take place when the actual crediting of the amount to the account of Radiomodelli.com by Ethnik which must be within 7 working days from the date of acceptance. Go beyond those limits, the order will be automatically canceled . All prices quoted on our website are inclusive of VAT (if applicable) at the rate in force. Users of credit cards are subject to authentication of credit card , resulting in authorization by the issuing institution. If the paper is rejected , our system will give immediate notice at the time the order is completed . In order to verify your request , it is possible that your personal information , such as address and zip code or tax code, is transmitted to third parties for verification of safety and operations in the context of prevention and fraud control. 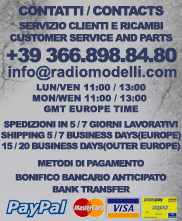 Radiomodelli by Ethnik making deliveries throughout Italy , including the islands EU and non-EU countries . The couriers with whom we collaborate carry out our deliveries from Monday to Friday , from 8:00 am to 19:00 pm Delivery times can vary by area , but the average is between 3 and 10 working days. For payments by bank transfer is required at least 3 days because the amounts are credited to our account. Radiomodelli.com by Ethnik will send the goods only after getting confirmation of receipt of payment. For all countries , deliveries are made on the first business day after the order , if the orders are placed before 13:00 hours , and if the chosen payment method is credit card or PayPal. Times may vary and are to be considered valid if there is no physical or structural impediments , such as errors in the data delivery due to force majeure or courier traffic / road problems and impediments . In the event that the carrier fails to make delivery , will make a second attempt the next day, or contact the customer to arrange a delivery date .